Clusters and nanocrystals are of great scientific and technological interest due to their size dependent properties. Changes in their electronic structure have been successfully described with the quantum confinement model, which predicts increasing band gaps with decreasing particle sizes due to shifts of the band edges towards higher energies. Now, soft x-ray absorption measurements of diamond clusters show that the bulk-related unoccupied density of states do not exhibit any such shift. Moreover, spectral features from the cluster surface termination appear below the bulk absorption onset, resulting in an effective shift of the lowest unoccupied states towards lower energies. These findings contradict the commonly used quantum confinement model. Quantum confinement is a very successful model for describing the size dependent electronic structure of nanometer sized semiconductor structures. Generally speaking, it predicts increasing band gaps with decreasing particle sizes due to shifting of the band edges. The majority of theoretical investigations on quantum confinement effects were performed on isolated particles with idealized structures and surface terminations. In contrast, experimental systems researched so far exhibit either a size distribution or are charged for mass separation, possess ill-defined surface reconstruction or termination, and are typically deposited on substrates inducing interaction with their environment while under investigation. Now, with the isolation of higher diamondoids a new class of clusters allows a study of quantum confinement in the molecular size limit. The diamondoids are extracted from petroleum and size separated by high-performance liquid chromatography in ultra-high purity. 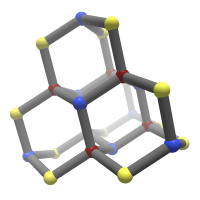 The first diamondoid, adamantane, consists of the smallest possible single cage unit excised from the diamond lattice, with each dangling bond terminated by hydrogen atoms. Each subsequent diamondoid adds one additional face-fused cage. From a basic sciences point of view the isolated diamondoids are perfectly size selected and hydrogen terminated semiconductor clusters in the bulk lattice configuration. Size dependent changes in the conduction band of individual diamond clusters were investigated by means of carbon K-edge x-ray absorption spectroscopy in ion yield mode. The experiments were performed at the high resolution soft x-ray beam line BW3 at HASYLAB. In brief, a monochromatized photon beam is crossed with the cluster beam under the aperture of a time of flight spectrometer. The photon energy is scanned through the carbon K-edge and the detected ionic fragments resemble the absorption spectra. The diamondoids are brought into the gas phase by gentle heating with a temperature stabilized in-vacuum furnace. 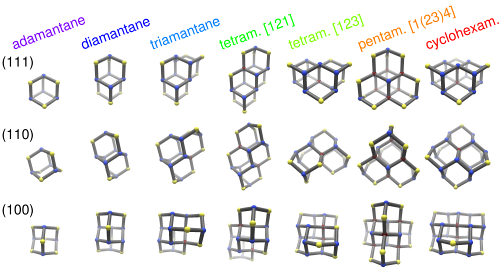 Comparison of the carbon K-edge absorption data for the series from adamantane (one diamond cage) to hexamantane (six diamond cages) with a bulk diamond crystal reference unveils interesting trends. 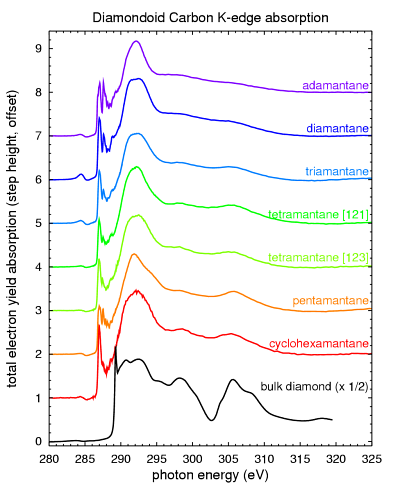 The spectra of adamantane resemble previous x-ray absorption spectra of the closely related cyclohexane. But through the series to larger sizes from adamantane to cyclohexamantane the spectra already begin to resemble the basic band structure of bulk diamond as the second absolute gap at 303 eV emerges. Additionally, the diamond cluster absorption spectra exhibit sharp spectral features below the bulk diamond absorption onset with clearly resolved vibrational structure. Analysis of the data shows the pre-edge features to be due to C-H and C-H2 bonds constituting the diamondoid hydrogen surface termination. Further, the density of states related to the interior C-C bonds appears to exhibit a similar absorption threshold as the bulk diamond crystal reference. The observed non-shifted absorption onset is further evidence for a special role of diamond within the group IV semiconductors. While earlier x-ray absorption measurements on deposited Si and Ge nanocrystals showed clear blue shifts of the conduction band minimum due to quantum confinement no such shifts could be measured for nanodiamonds with 4 nm in size. Various theoretical investigation of diamond clusters predict increasing band gaps for decreasing sizes only below one nanometer. Depending on the calculations, the predictions show contradictory results, with either significant or no blue shift of the lowest unoccupied density of states, i.e, blue shifted and non-shifted absorption edges. The theoretical models, however, do not appropriately predict the observed additional density of states below the bulk absorption onset due to the hydrogen surface. These specific states, which have been observed for the first time, effectively reduce the overall particle gap. They are fixed in energy and agree energetically with the carbon - hydrogen bonds of cyclohexane in the molecular and diamond surface states in the solid state limit. The present experiments show that the hydrogen surface atoms have a significant impact on the overall electronic structure of the diamond clusters to a degree where they dominate the absorption onset and thus lowest unoccupied states.